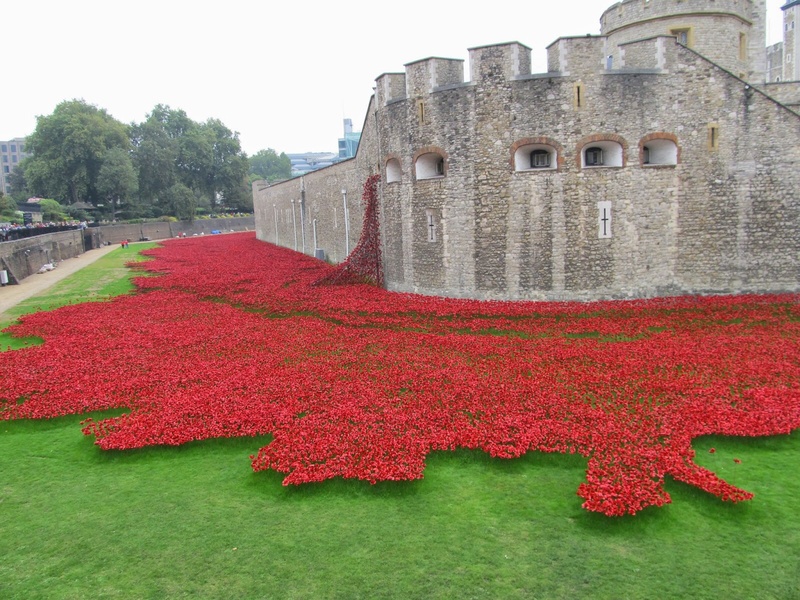 The installation Blood Swept Lands and Seas of Red, marks the centenary of the outbreak of the First World War. Created by ceramic artist Paul Cummins, with setting by stage designer Tom Piper, 888,246 ceramic poppies have been used to fill the moat at the Tower’s of London. So far four million or so people have gone to see it and a Huge demand from the public has triggered a campaign to extend the lifespan of the installation and floodlights are already being used to ensure that as many people as possible get to see it. However Historic Royal Palaces, which runs the Tower of London, has said it intends to start dismantling the artwork on November 12, the day after Armistice Day, removing and cleaning the ceramic poppies before dispatching them to buyers, who have paid £25 per poppy to raise money for armed forces charities. However The Weeping Willow and the Wave will stay in place for longer, before being sent on a tour of sites across the UK until 2018. They will then go on permanent display at the Imperial War Museum, ensuring that this poignant memorial will be saved for the nation. There are also many events in London over the next few days to mark Armistice Day, including the festival of Remembrance and the traditional Remembrance Sunday cenotaph parade in Whitehall, attended by members of the Royal Family, politicians and current and ex-servicemen (from 9.20am); two matinee concerts of remembrance at the Royal Albert Hall from 2pm; and free children’s workshops at the Imperial War Museum until 11 November. There are similar events in almost every British town and city. In Edinburgh, there will be a service at 10.50am tomorrow on the Garden of Remembrance next to the Scott Monument. Wales will hold a national observance of remembrance in Cardiff. Elsewhere on 11 November A new, circular, sunken panel carrying the names of more than 600,000 soldiers – French, British, German and many other nationalities – who died in this one region of France between August 1914 and 11 November 1918, will be unveiled at the French war memorial at Notre Dame de Lorette in northern France and the names of former comrades, former allies and former enemies will be listed together, alphabetically, with no distinction of rank or country. President François Hollande will open the memorial. The Royal British Legion recently unveiled a 20ft high brass statue of a First World War soldier – Every Man Remembered by Mark Humphrey – in Trafalgar Square. The statue will go on a four-year tour of Britain to promote the legion’s campaign to ask the public to write a message of commemoration for each of the 1,117,077 Commonwealth servicemen and women who died in the First World War. The sculpture was unveiled by Mr Humphrey and Serena Alexander, whose marine son Sam Alexander MC, died in Afghanistan in 2011. The Royal British Legion Festival of Remembrance takes place on Saturday 8 November at the Royal Albert Hall, London. The event, which has been held since 1927, is held in remembrance of all the soldiers who gave their lives during the First and Second World Wars. It will be Attended by HM Queen Elizabeth II AND HRH Prince Philip, the Duke of Edinburgh, Prime Minister David Cameron and his wife Samantha and Deputy Prime Minister Nick Clegg. The Royal British Legion festival, includes the traditional two-minute silence as poppy petals fall from the roof of the Royal Albert Hall, each representing a life lost in war. The event, which had an audience of veterans and their families, is intended as a moving tribute to the country’s fallen. Around 150 personnel from the army, navy and Royal Air Force mark the two-minute silence and a bugler plays The Last Post before a piper from The Royal Dragoon Guards plays a traditional lament. The event culminates in the traditional release of thousands of scarlet poppy petals from the roof of the Albert Hall to represent all those who have died in combat and remember those who sadly paid the ultimate price. There are still four years of commemorations to come before we reach the centenary of the Armistice on 11 November 2018.
ernational Day of Radiology (IDoR) is celebrated annually on November 8th to promote the role of medical imaging in modern healthcare and mark the anniversary of the discovery of x-rays on November 8th 1895 by Wilhelm Conrad Röntgen, who effectively layed the foundation for the new medical discipline of radiology.